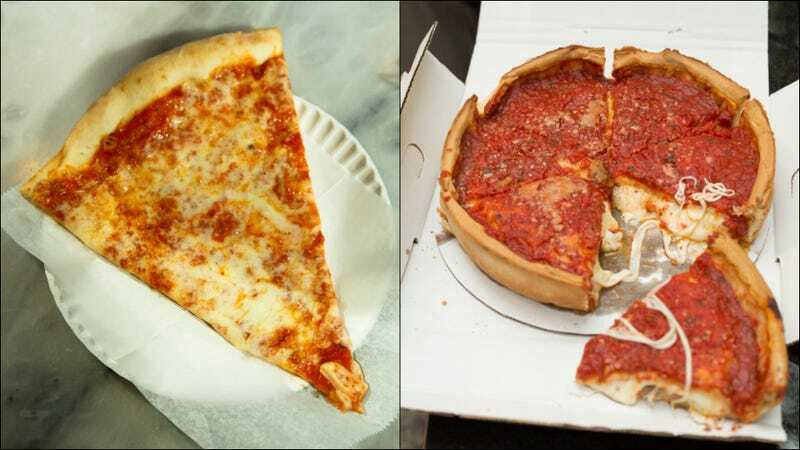 National Pizza Day came and went this past Saturday, and police departments in two of our nation’s most esteemed pizza cities decided the only way to mark the occasion was promote understanding the only way #nationalpizzaday would allow: tasting each other city’s pizza. First off, well done on getting Chi-CAH-go central casting. But let us make clear: Their verdict of “It’s all right” is the highest praise a Chicagoan can heap on a foodstuff that didn’t originate in the 312. Ice cold, New York, ice cold. The officers here couldn’t give the appearances of two shits with even a second bite. What to make of this? While this stunt sounded innocuous on paper (and hey, free pizza for the men and women in blue), what exactly was the point of this? To puff our chests in the name of civic pride? To underscore how pointless pizza allegiances are? Or, as I suspect given CPD’s lukewarm answer and NYPD’s outright disgust, to claim that New York-style pizza may actually be the superior pizza? Perhaps the two police departments can reprise this on July 18, when it’s National Hot Dog Day and the results will likely be different. Because a New York dog with vomit-colored sauerkraut is inarguably disgusting.